*Potential heat loss during the winter and air-conditioned air escaping into the attic during the summer. 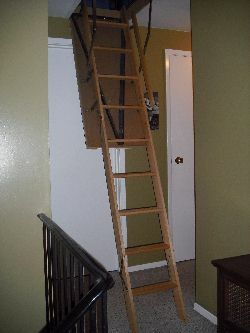 * Attic dust can accumulate on the folded stairs when they are not used for a long time. So, when the stairs are lowered, it can create quite a mess. Spreading out an old bed sheet on the floor before lowering the stairs will make cleaning up easier. 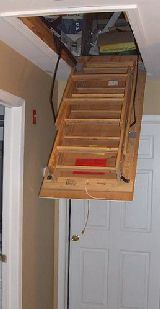 Attic stairs are retractable ladders that are installed into the floor of an attic and ceiling of the floor below the attic. They are inexpensive, compact and easy to install. They are also used to gain access to the space above the garage ceiling. In either case, they do not take up any floor space as they are stored within the ceiling framing when not in use. A pull-down pole or drawstring is used to pull the unit down. The stairs come as pre-assembled kits and can be purchase at your local building supply store or online. I checked a few stores in my city and found that all units measure 22 1/4" wide so they will fit in between two trusses if they are spaced at 24" (61 mm) center. They are either made of wood or aluminum. Installation. In older homes the 2"x5" or 2"x6" ceiling joists are usually spaced at 16" center. It is fairly easy for an experienced do-it-yourself person to frame the required opening for installing the attic stairs. In homes built after the mid to late 1960s the ceiling "joists" are the horizontal members of roof trusses. They are usually made of 2"x4"s and are spaced at 24" (61 mm) center. As the bottom part of the truss is an integral part of the entire truss an expert should be consulted before starting the job. Because of the many horizontal and diagonal truss members there is not much open attic space and installing attic stairs may not be a good solution to your storage problems. Adding insulation. Some attic stairs sold today come with a fire retardant, insulated door panel and a four-sided door seal. The insulation R-value for the attic stairs (new or existing) when closed, should be R32-R40 or of the same R-value as the attic insulation. The joists around the opening in the ceiling should be built up to approximately 2" (50 mm) higher than the stairs when in closed position. Next fit a piece of 1/2"(12.5mm) or 5/8"(15.5 mm) piece of plywood over the raised sides. Then depending on where you are planning to store items, install a full length piano hinge to either the short or long side of the plywood to create a second door. Next, install weatherstripping to this plywood door like you would do with any exterior door. The plywood is then covered with high density foam insulation. The R-value of the door insulation should match the R-value of the attic insulation. The thickness of the door insulation depends on the R-value per inch. On average high density foam insulation has a rating of R-5 per inch. So, if the attic has R-40 insulation, the door should have 8" (20cm) of foam insulation. The insulation can be glued to the plywood without any further framing or support. Just make sure to use an adhesive that is specifically made for gluing foam insulation. If you use the wrong type of adhesive it will dissolve the foam.